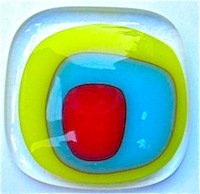 An offset glass pendant fully fused from four layers of clear and colored fusing glass. The pendant is made with the three color pieces being offset from the transparent base and then fully fused so as to produce a nicely contoured original piece of hand made jewelry. Being fully fused the pendant has a nice smooth top with very rounded edges. This item can be made with any color you choose as well as with different dimensions. The added layers can be decreased or increased to produce different outcomes. It can be made with either Bullseye or System 96 products. 1 piece of clear for the base about 1 3/8" square. 1 piece of yellow about 1 1/16" x 1 3/16". 1 piece of blue about 5/8' x 7/8". 1 piece of red about 7/17 x 9/16"
Step 1. Cut layers to size as outlined above. Step 2. Clean and dry pieces thoroughly. Step 3. Stack the yellow, blue and red pieces on the clear base, offset the three colored pieces slightly as per the photo. Keep the yellow layer back from the edges. Do not get finger marks on the layers, hold by the edges only. Step 4. Using primed shelf or thin fire paper place stacked item on shelf. Put shelf into glass kiln. Step 5. Bring temperature up gradually to about 1500 F (816 C). Hold at around 1500 F temperature for 15 minutes. Check to see if the layers are fully fused. Step 6. If fused, switch off, vent kiln and allow temperature to drop to about 1000 F (540 C). Close kiln and cool to room temperature. Step 7. When fully cooled remove pendant from glass kiln. The pendant should be nicely rounded with the layers fully fused into each other. A pendant bail can be epoxied to the rear.